DandDCustoms GI JOE Snake Eyes Commando Black Ops Version 3 6.5 inch fully poseable Marvel Legends Style action figure. Custom sculpting and painting. This one is reminiscent of the 1990 version snake eyes. We gave him a light grey jacket. 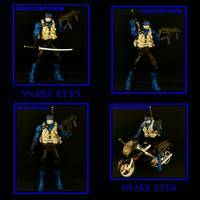 We have all together about 35 or more gi joe cobra marvel legends style customs with multiple variations of them. Please browse our other customs to see prior gi joes. We try to put up one a day on this site. 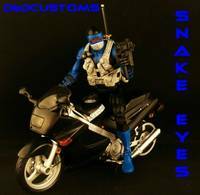 This is our Snake eyes version 3 3 of 6. I hope you like him. This is our 5th Snake Eyes. darn! I totally forgot about that Snake Eyes came in that style. Brings back crazy memories of my G.I. Joe collecting days. Very nice, different!